As you know, things snowball around here. First it was a broken oven, suddenly it was a kitchen remodel and a bathroom disruption. I can’t actually call it a bathroom remodel as Wayne put his foot down. He was ok with moving the hot water cylinder. He was ok with removing the bathtub to get to the pipes and cause we never use it and it really needed to be gone. He was not ok with me adding to the work (and cost) by redoing the bathroom “while we’re at it”. That doesn’t scare me. For one thing, just having the tub out makes a huge difference, and I love the shelves I put in. There’s tons I can do to make room more user-friendly and less gag-worthy. And in a year… who knows…? 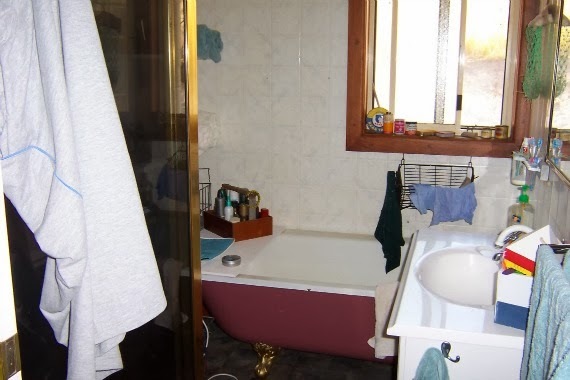 To recap… This is what the bathroom looked like before we removed the bathtub. A tiny square room with lamipanelled walls. Ick. 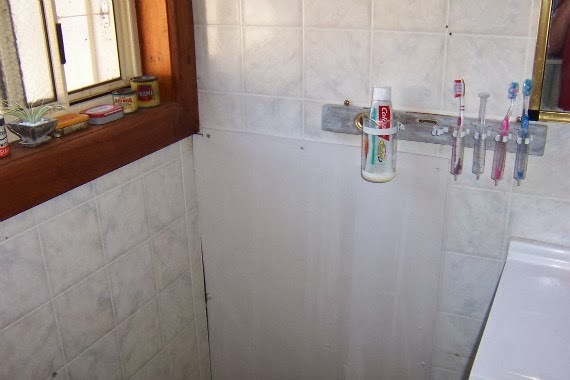 You had to walk in between the shower and wall, then almost turn sideways to get past the corner of the shower and the vanity. 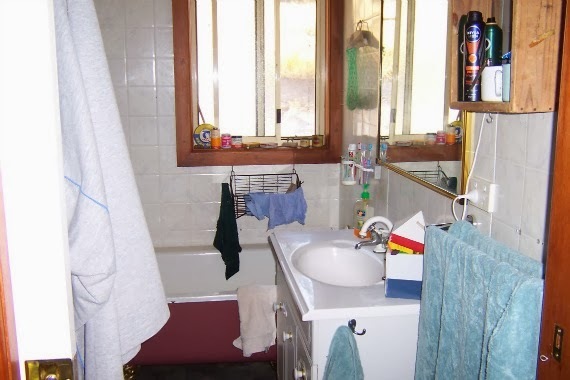 Once in, you had a narrow space between the shower, bath and vanity in which to do your thing. Once the bathtub was removed, we suddenly had space! The entry was still cramped, but then it opened up into a much bigger room than before. 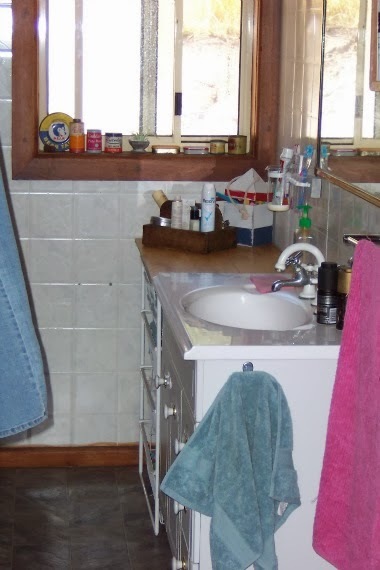 With the shelves on the wall for storage and an empty wall opposite I can move the towel rails and hangers from the left and right of the doorway, giving you a sense of more space. Removing the bathtub left a huge hole in the wall where the laminpanel was broken to get to the pipes. Easy fixed. I got a piece of masonite from the casita (see? keeping things comes in handy), cut it to size and screwed it onto the wall. I then got out one of my many mixed up paint colours and found one that almost totally matches the colour of the walls. I then looked around the house for a piece of furniture I could put in the space for storage and added bench space. I found an old wire drawer unit I’ve had for yonks. 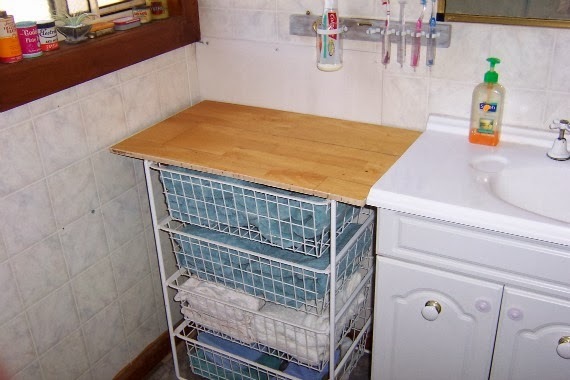 Its hand many roles over the years – bedside table when I was a student, linen storage, dog towel storage. For the last couple of years its been unsused space in the laundry. A good wash and a top was all it needed to bring it into the bathroom. I had some laminate flooring pieces I got off a friend. I cut one to size and voila – new top! Laminate flooring clicks together so I had to reinforce by screwing a couple of pieces of wood underneath. I love the extra space it gives me now. And while we’re at it, I might add a small note on the toothbrush holder. Remember the toothbrush holder I was so happy with? Well, turns out test tubes are the worst thing you can use to hold toothbrushes. Water dripping off the ends gathers in the bottom and become stagnant and the stench is unbelievable. I had to replace them with large gauge syringes. They still get gunky at the bottom and need cleaning now and then, but they let the water out and don’t stink! I should be posting that in my failed projects!